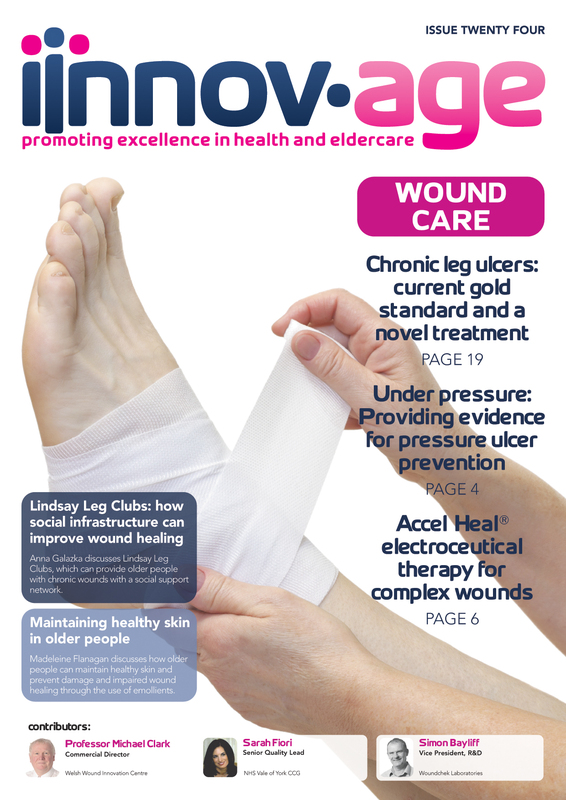 We are pleased to announce the release of Issue 24, our issue focusing on wound care. Each issue of Innov-age features articles written by leading professionals from both within and outside the NHS, sharing best practice and innovation and helping to improve the care and safety of older people. Leading this issue, Dr Ross Atkinson and Dr Jacqueline Lavallée discuss the evidence relating to the two main methods of preventing pressure ulcers; the use of support surfaces and repositioning of the patient. Anna Galazka discusses Lindsay Leg Clubs, a social support system for elderly people who suffer from chronic wounds, to allow them to share experiences and socialise with a strong support network, and find ways to better manage their wounds. Ingrid Skjæveland introduces soluble beta-glucan as a wound therapy, and discusses how this can be used to treat wounds and to restart the healing process in slow-healing and chronic wounds. Liz Ovens introduces Accel-Heal®, an electroceutical therapy for complex wounds, which uses subsensory electrical stimulation to reduce inflammation and ‘kickstart’ the wound healing process in non-healing and chronic wounds. Sarah Fiori discusses a recent evaluation of the Mercury Advance Hybrid Mattress at a care home in the NHS Vale of York CCG, and how this, combined with ‘React to Red’ training, compares to traditional alternating air mattresses in preventing pressure ulcers. Also in this issue, Simon Bayliff introduces WOUNDCHEK™ Bacterial Status and WOUNDCHEK™ Protease Status, point-of-care tests that enable the diagnosis of infection and inflammation in wounds; Madeleine Flanagan discusses the importance of maintaining healthy skin as we age, and how moisturisers and emollients can be used to protect older skin and prevent damage; Dr Elena Garcia and Dr Sonia Ho discuss the RAFT Institute’s Smart Matrix®, an advanced wound care product that has the potential to heal full thickness wounds without a skin graft; Sarah Fiori and Mel Johnson discuss how the implementation of React to Red training through Safety Huddles in care homes impacts on staff motivation and the promotion of a safer care environment, and Professor Michael Clark discusses the measurement of performance of special pressure redistributing mattresses, and how the Welsh Wound Innovation Centre is working towards establishing a comprehensive mattress test facility. Innov-age is published in both print and digital versions, and has been launched by the Edward Centre for Healthcare Management Research, part of the Edward Healthcare group of companies and produced in association with TRUSTECH, MIMIT and MAHSC to promote excellence in elderly healthcare. Each issue of Innov-age features articles written by leading professionals from both within and outside the NHS, sharing best practice and innovation, helping to improve the care and safety of older people.